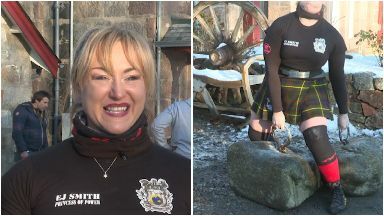 Emmajane Smith, 32, is the first woman ever to lift the Dinnie Stones without straps. Scotland's famous Dinnie Stones are so heavy that most strongmen can't lift them. But now a 32-year-old from Ayrshire has become the first woman to lift the huge boulders without straps. Emmajane Smith completed the incredible challenge at Portach in Aberdeenshire. Together, the two granite boulders weigh almost 730lbs - the equivalent of about five men. The powerlifter was thrilled and proud to take her place in the record books. "It felt amazing," she said. "I was really hoping today was going to be a special day and it was, so I'm ecstatic. "I'm so thrilled that I got the wind under the stones, so today is beyond my expectations." Moments earlier, the professional horsewoman from West Kilbride became the second Scottish woman to lift the massive granite stones with straps. Emmajane won the European Women's Power lifting championship for her weight group of 82.5 kilos last year. She was also Scotland's strongest women in her category in 2017. She only heard about the stones in December so completed her amazing challenge with very little training. The Dinnie Stones sit outside Portach hotel near Aboyne in Aberdeenshire, enticing athletes from around the world to try and lift them. It's a challenge which dates back more than 150 years when local strongman and sporting hero Donald Dinnie carried the granite boulders from one side of the Portach bridge to the other. After Emmajane hauled her way into the history books, a strongman then broke the record for lifting the stones. 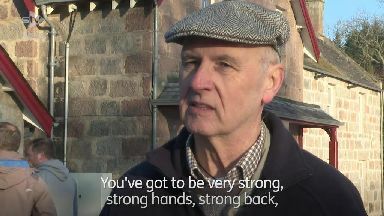 Mark Haydock, from Lancashire, held the two boulders for 41.3 seconds, beating his own previous record. He said: "When I set the previous record of 38.6 I always knew there was more in the tank and, believe it or not, I think there's more in the tank. "There a lot of history with the stones. "It's a great benchmark as a feat of strength and once you get involved there is no getting out of it. "I've been coming up to Aberdeenshire for seven years and it just feels as magical every time." A total of 98 people have now lifted the Dinnie Stones - the hunt is now on for the 100th.